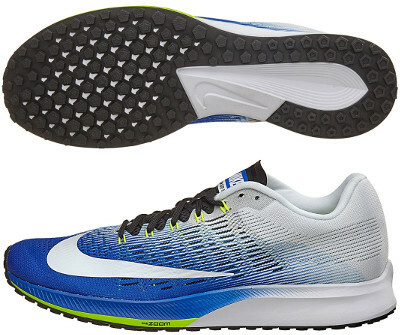 Nike Air Zoom Elite 9 are neutral performance running shoes. Renovated Nike Air Zoom Elite 9 looks for its own place within performance running shoes market bringing improved features from other Nike successful models like the popular Air Zoom Pegasus 33 and racing flat Zoom Streak 6. Reduced weight and just 8 mm drop are key indicators for Air Zoom Elite 9 to produce a great blend of cushioning and response to maximize performance in both daily training and racing distances up to marathon. Upper in Air Zoom Elite 9 is based on breathable Flymesh which hides well-known Flywire system embracing midfot for snug fit. Gusseted tongue features soft feeling and great comfort preventing strange movements when running as fast as possible. Keep in mind these are narrow running shoes so maybe runners would miss some space specially for midfoot. Cushlon EVA midsole delivers softer feel than predecessor Air Zoom Elite 8 and includes one unit of beloved Zoom Air in forefoot for improved cushioning and quicker response. Outsole design gets rid of typical large grooves and focus on multiple pentagon lugs which not only adapt better to terrain with increased flexibility but also provide great traction for easier swing phase.